Hello everyone hope you are well. How was your March? For me, it was an exciting month. I had great fun exploring new places within my city & catching up with one of my dear friends. Well, the temperature has started to rise this week & the heartless summer is approaching fast which will make me wanna hibernate in my comfy home. But this year, I am determined to face it & let it not affect my blogging activities. Let's see how far I go. Wish me luck. Today I will talk about little white dress or lwd. Well I believe every girl has an lwd in their wardrobe but it is not as popular as an lbd & rightly so. But lwd is also a very classy item & one can get a posh look in it when styled with the right statement accessory. 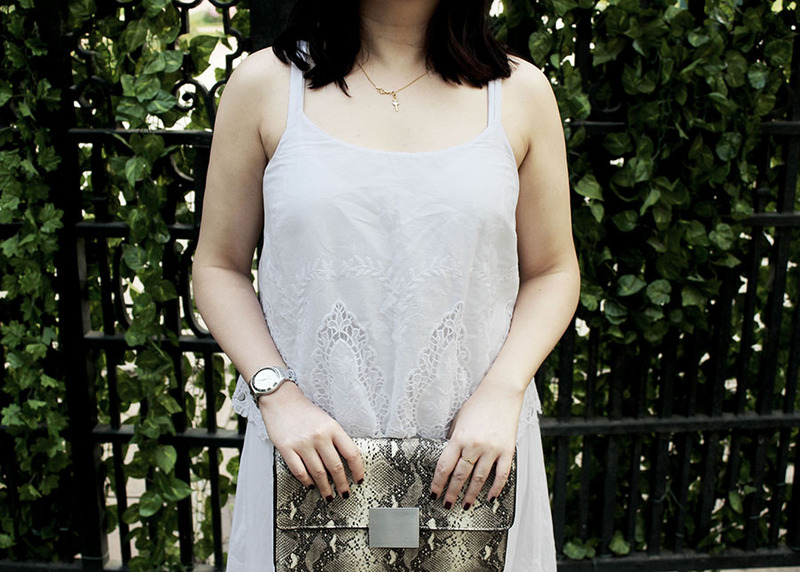 Here I am wearing an lwd & carrying a snakeskin pattern bag to up the luxe factor. I love the detailed hem ( just the right amount of details and not overdone ) of this lwd and the snakeskin pattern bag is my current favorite. So what do you think of the outfit? And how do you style your lwd? Till next time, bye. This white dress is so gorgeous, that lace hem is so pretty! Loving the monochrome accessories as well! Gorgeous dress, love the lace details. Perfect spring style. Love the white dress. Love the dress and this clutch is so pretty! Wow!Amazing look and photos! Love it! Lovely outfit, great details and amazing photography! I love the dress paired with the snakeskin boots! goes so well together! You put everything together so well. Yes, you cannot overlook a white dress, it can be a very fashionable outfit if worn nicely like what you've done here. Love this white dress! The details are so pretty! Wonderful dress! I love it as a staple and actually more readily gravitate toward it during the summer than the little black dress. :) A great fitting white dress looks so elegant! Wishing you the best for April! these photos are awesome, you look great and i love the dress and clutch! I LOVE your LWD, Eva! The style is so pretty and I love how you paired it with the black boots and snakeskin clutch to give it more of an edgier vibe! Thanks so much for sharing and I hope you have a lovely week ahead, girlie! I love how you styled the dress you look feminine and chic at the same time. This is gorgeous! I love your bag here, so pretty! Beautiful photos too! I love the dress, but I love how you styled it even more, Eva:) I think that an animal print clutch and black ankle boots make it so urban and cool. Great look. Super pretty this white dress,pretty delicate!! And as always the pics are amazing!! Beautiful dress and photos Eva! You are so beautiful! Love your dress! That dress is perfect! You look amazing! I love that white dress!! The detail is so beautiful :) Love how you styled this look! This little white dress is so beautiful! Love your look. I cannot get enough of snake prints. Lovely!! I love lwd, so perfect for summer and you look wonderful. Love this amazing white dress! !